Harnessing technology to elevate the patient experience is one of the biggest opportunities hospitals currently have. However, big shiny screens are just that if they aren’t thoughtfully integrated into a larger wayfinding strategy. 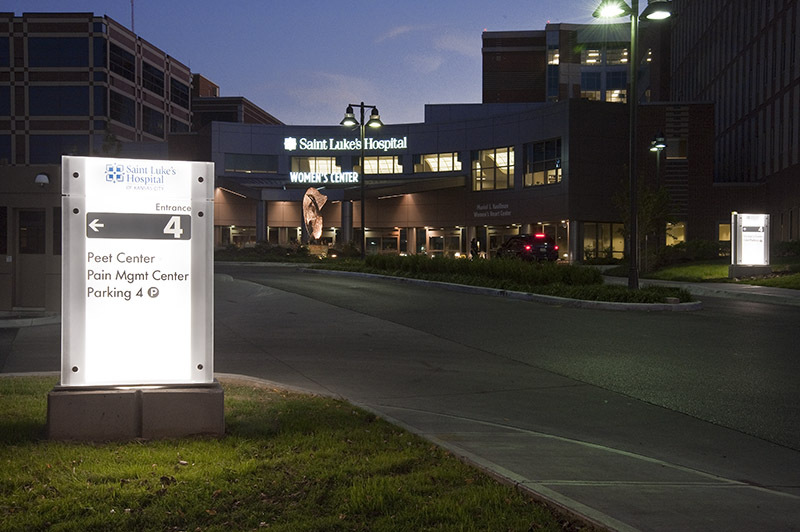 We like highlighting the Saint Luke’s case study because it was the needs articulated in charrette sessions with the hospital’s key stakeholders that lead to the digital solutions implemented. Measuring 16 feet by 4 feet, the history wall has quickly become the focal point of the wayfinding and branding program. 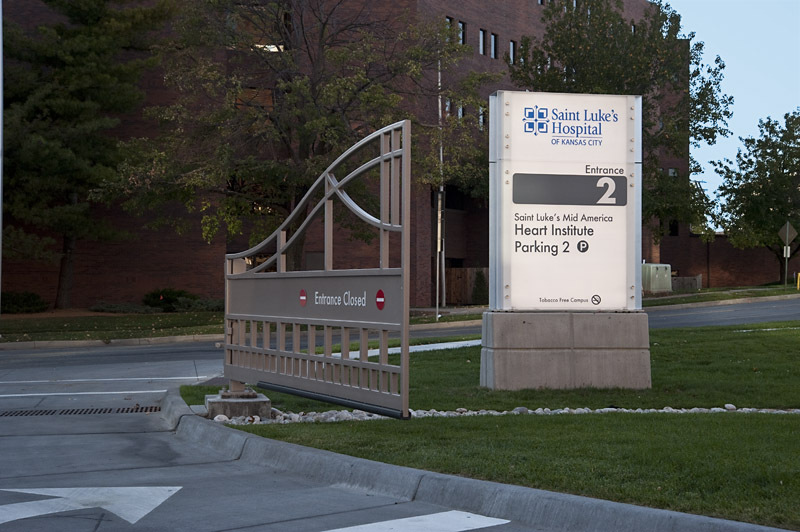 Saint Luke’s wanted to provide visitors with a positive distraction and share their success stories over the last 125 years to reinforce that their loved ones were in good hands. 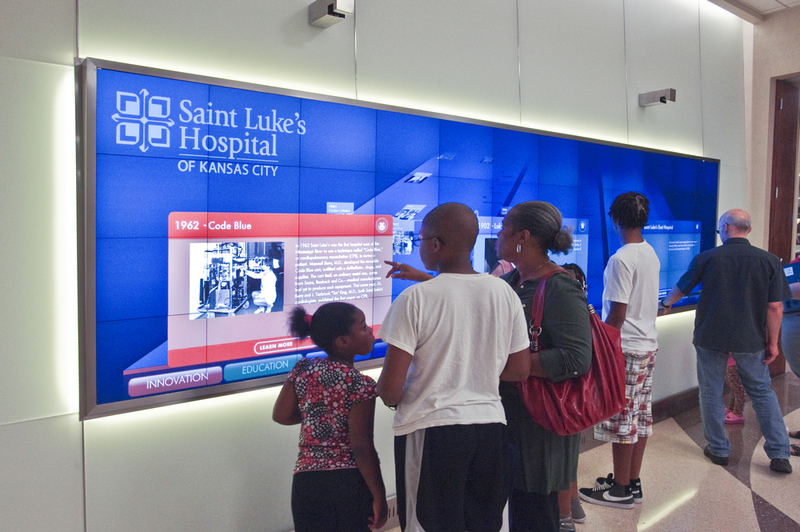 Up to 3 users can simultaneously interact with the wall exploring videos, testimonials, medical artifacts, and 3D renderings all sourced from the Saint Luke’s Archives. The history wall even utilizes gestural tracking so it can interact with users before they’ve even touched the wall. 19 million pixels never looked so good. From wood plaques to high tech, the new donor wall enables the foundation to engage visitors in a much more meaningful way. Donor profiles, patient stories, information on how donations are used, and upcoming fundraising events can now be easily added to the digital display in the center. While the foundations budget didn’t allow for digital displays running the full width of the wall, a similar impact was achieved by flanking the center display with acrylic panels listing 500 donors; these panels are backlit with LEDs to match the color of the center display thus expanding the impact of the donor wall across the entire width. 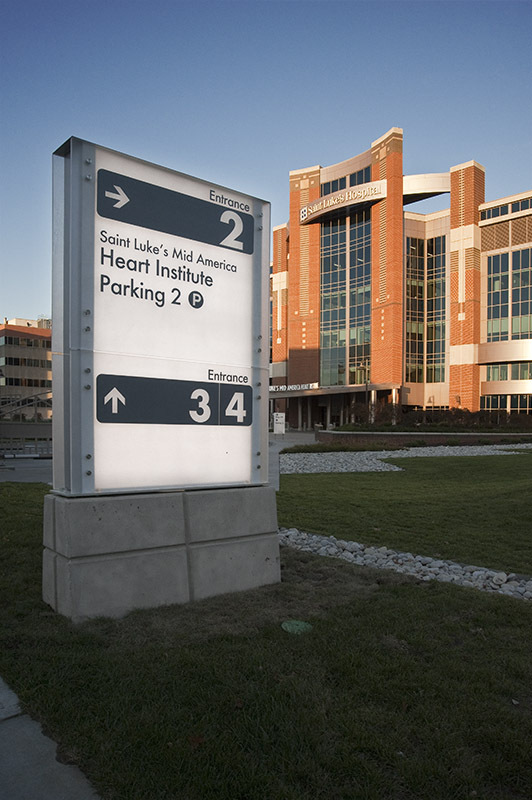 As hospitals expand so do their navigational challenges. In order to minimize this, 7 wayfinding kiosks are strategically located throughout the hospital’s main entries. Theses kiosks provide a visual model of the path of travel, turn-by-turn directions, and the ability to print out customized directions eliminating the need for memorization. All the fanciest tech in the world doesn’t mean a thing if there’s not a solid foundation of signage and wayfinding it’s built upon. 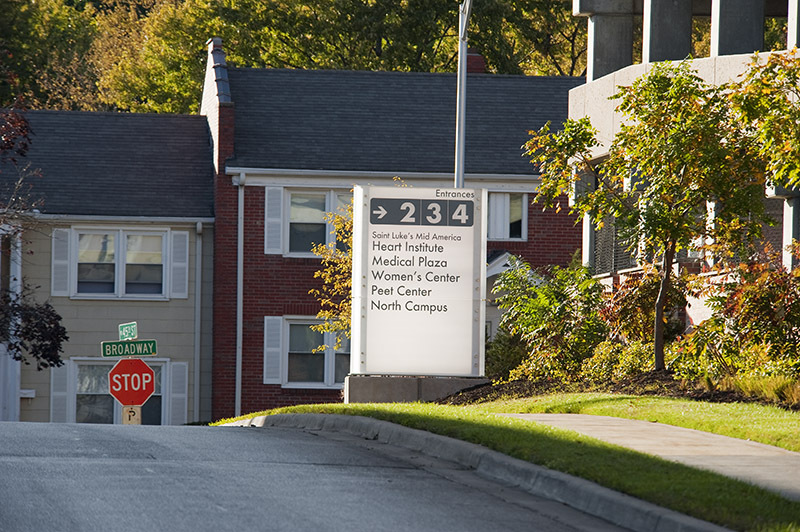 With Saint Luke’s most recent expansion, they taken the opportunity to look at the campus as a whole and reestablish an identity that had become lost in the urban landscape over time. 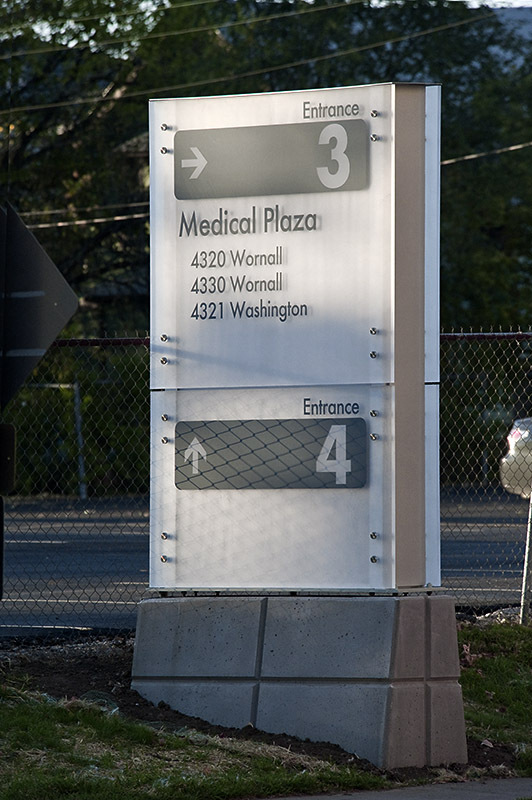 Wall-mounted signs expand the distance from which the hospital can be seen and identified from key paths of travel. Illuminated monument signs create pillars of light clearly establishing the boundaries of the campus. Explore our other work in the Healthcare arena.